Swissprot predicts mouse CDKL5 protein to be ~105 kDa (Q3UTQ8), however a recent paper by Lin et al, 2006 (PMID: 16330482) indicated CDKL5 to run at ~118 kDa on WB. On this basis we think that the ~120 kDa band we observe using Rabbit polyclonal to CDKL5 (ab22453) on mouse tissue is CDKL5 specific. Futhermore the ~120 kDa band is blocked by the immunising peptide. The larger ~200 kDa is potentially also CDKL5 as a similar band is also observed in the Lin et al (2006) publication. There is evidence for larger forms of CDKL5 for the human version of the protein, so it may not be surprising to find a similar scenario for the mouse protein. Synthetic peptide conjugated to KLH derived from within residues 750 - 850 of Human CDKL5. Our Abpromise guarantee covers the use of ab22453 in the following tested applications. WB Use a concentration of 1 - 3 µg/ml. Detects a band of approximately 120,160 kDa (predicted molecular weight: 105 kDa). IHC-P 1/800. Perform heat mediated antigen retrieval before commencing with IHC staining protocol. Swissprot predicts mouse CDKL5 protein to be ~105kDa (Q3UTQ8), however a recent paper by Lin et al, 2006 (PMID: 16330482) indicated CDKL5 to run at ~118kDa on WB. On this basis we think that the ~120kDa band we observe using Rabbit polyclonal to CDKL5 (ab22453) on mouse tissue is CDKL5 specific. Futhermore the ~120kDa band is blocked by the immunising peptide. The larger >150kDa is potentially also CDKL5 as a similar band is also observed in the Lin et al (2006) publication. There is evidence for larger forms of CDKL5 for the human version of the protein, so it may not be surprising to find a similar scenario for the mouse protein. ab22453 staining nuclear CDKL5 in Human appendix. The paraffin embedded human skin tissue was incubated with ab22453 (1/800 dilution) for 30 mins at room temperature. Antigen retrieval was performed by heat induction in citrate buffer pH 6. Ab22453 was tested in a tissue microarray (TMA) containing a wide range of normal and cancer tissues as well as a cell microarray consisting of a range of commonly used, well characterised human cell lines. 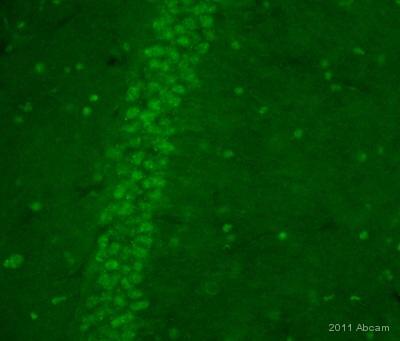 IHC-FoFr image of CDKL5 staining using ab22453(1:300) on Mouse hippocampus sections. The sections used came from animals perfused fixed with Paraformaldehyde 4% with 15% of a solution of saturated picric acid, in phosphate buffer 0.1M. Following postfixation in the same fixative overnight, the brains were cryoprotected in sucrose 30% overnight. Brains were then cut using a cryostat and the immunostainings were performed using the ‘free floating’ technique. Publishing research using ab22453? Please let us know so that we can cite the reference in this datasheet.